If you think rush hour traffic around Los Angeles is slow, stop to consider the many delays experienced by the Toyota C-HR. We first saw it back in 2014 and we've been waiting for it ever since. The production spec model made its first appearance earlier this year in Geneva, and this week it finally showed up in America, making its debut at the 2016 Los Angeles Auto Show. It'll be a bit longer 'til it's available at Keyes Toyota, but it's looking like all the waiting will be worthwhile. The "C-HR" in this subcompact SUV's name means "Coupe High Rider." The "High Rider" part makes sense given the crossover design. The coupe part makes sense once you see the new Toyota SUV in profile. Where many of its competitors use optical illusions to create the appearance of a sloped roof line on their crossovers, this is the real deal. Based on the Toyota New Global Architecture (TNGA) platform, its stiffer body and low center of gravity promise handling that's as sharp as its looks. The first model year will feature two trims, the XLE and XLE Premium. Both will have the same four-cylinder engine (with 144 horsepower and 140 pound-feet of torque) and continuously variable transmission for their powertrain. Front-wheel drive with torque distribution is standard. Other features include the Toyota Entune infotainment system, AM/FM/HD radio, Bluetooth, an AUX jack, and a USB port. Early indications are that in addition to the usual passive safety features, a number of active safety and driver assist features will be standard equipment. We're still waiting for confirmation on pricing and option packages, and it also remains to be seen whether AWD will be an available option for the first year. 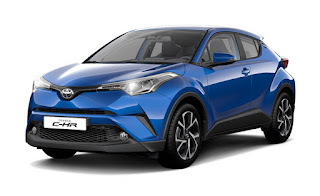 The Toyota C-HR comes to Keyes Toyota in mid-2017 as a 2018 model. If you'd like to learn more, or if you're just itching to get behind the wheel of a new Toyota car like the 2017 Toyota RAV4, visit Keyes Toyota at 5855 Van Nuys Blvd in Van Nuys, CA today. It's been a long time since we've seen a Toyota Corolla hatchback in the United States. They've been available to the rest of the world as the Toyota Auris, but they never quite caught on in the States. The last time was the Toyota Corolla-derived Toyota Matrix, which the company discontinued in 2013. Now they're trying again. San Fernando drivers can get behind the wheel of the 2017 Toyota Corolla iM, available now at Keyes Toyota. Currently, there's only one trim. A 1.8 liter 4-cylinder engine with 137 horsepower, paired to a manual transmission, is standard. 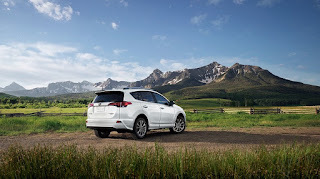 You can upgrade to a CVT (continuously variable transmission) for slightly higher gas mileage and Sport Driving Mode. The exterior is re-styled slightly with a more aggressive look than the sedan version of the Toyota Corolla. The rear is also different, not only because of the hatchback, but also due to the chrome-tipped exhaust and rear spoiler. Its sporty looks are rounded out by sport suspension and 17-inch wheels. You won't find much here by way of options and upgrades; since there's only one trim, it's all about the standard equipment. That includes a rear backup camera, keyless entry, and a leather-trimmed steering wheel with audio controls. There's a generous 20 cubic feet of cargo volume (that's more than some crossovers). Fuel mileage is an EPA estimated 27 city / 35 highway / 30 combined miles per gallon, contributing to a low total cost of ownership. The 2017 Toyota Corolla iM is practical. However, it also has its fun side, thanks to Toyota iM Display Audio. This infotainment system has a 7-inch display, USB 2.0 port, HD radio, voice recognition, and Bluetooth. You can upgrade it to run navigation alongside the applications it already supports. Ready to test drive your 2017 Toyota Corolla iM? Visit your San Fernando area Toyota dealership. Keyes Toyota is located at 5855 Van Nuys Blvd in Van Nuys, CA. *With manual transmission; 31 combined MPG with optional CVT. Thanksgiving is coming, and we're already running down our mental checklists. Do we have enough marshmallows for the yams? How do we keep the dinner table conversation away from politics? How do we keep Uncle Gary away from the pumpkin pie 'til dessert is served? And do we really feel like waiting on line for six hours for a flat screen TV? We don't have easy answers to the first few questions, but we do know this: if you get a new Toyota car or SUV at Keyes Toyota, you can skip the lines and sleep in late on Black Friday. It's a great time to do just that because, this year, Keyes Toyota is able to offer some excellent manufacturer incentives. Through December 1, well-qualified customers can get cash-back incentives, low APR rates, and lease incentives on most 2016 and 2017 Toyota models. That means significant savings for the customers we serve from Van Nuys to North Hollywood. Those of you looking for Toyota Certified Used Vehicles aren't left out in the cold, either. 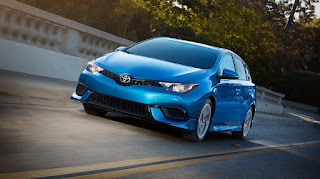 Certain pre-owned cars and SUVs (the Toyota Camry, Toyota Prius, Toyota RAV4 and Toyota Corolla) qualify for 1.9% APR financing, while all other TCUV models qualify for 2.9% APR financing. In addition, a 12-month/12,000-mile Limited Comprehensive Warranty, a 7-year/100,000-mile Limited Powertrain Warranty, a year of Roadside Assistance, and other perks are included. Weigh your options (and your option packages) carefully, and then come to Keyes Toyota. We serve Van Nuys and North Hollywood from our showroom at 5855 Van Nuys Blvd in Van Nuys, CA. We'll help with your finance, trade-in, or lease questions. We'll help you find the right car, and help you check off one more person from your holiday shopping list, even if you're that someone. Sounds better than hand-to-hand combat over doorbusters, doesn't it? Stop by today and ask your Van Nuys Toyota dealer for details! Thanksgiving isn't the only big upcoming event we're looking forward to at Keyes Toyota. In just a couple of weeks, the 2016 Los Angeles Auto Show opens at the Los Angeles Convention Center. Although it's open to the public between November 18 and November 27, there's one particular date you'll want to keep open. That date is November 18. Not only is that opening day (except for the press, who are treated to the AutoMobility expo from the 14th to the 17th), it's also the second annual Toyota Day. If you're attending -- and we suggest you go at least once in your life, because this really is a car-lover's dream -- bring a friend. For one day only, all you have to do is show the key to your Toyota vehicle when you buy your general admission ticket and your friend gets one too. For free. Many of the car companies that will be in attendance have kept a tight lid on what they'll show this year, and the Toyota Motor Corporation is no exception. If we had to guess (and we do, for now), we'd expect to see new Toyota models like the 2017 Toyota C-HR and 2017 Toyota Prius Prime, as well as a possible curtain call for the Toyota Yaris rally concept. What we're really hoping for is a preview of a 2018 Toyota model, or a surprise appearance by a concept car nobody's seen yet. If you can't make it to the LA Auto Show in time for Toyota Day, don't worry. Keyes Toyota doesn't have concept cars, but what we have may actually be better: new Toyota models you can actually get in and drive. We serve Los Angeles and Oxnard from our showroom at 5855 Van Nuys Blvd in Van Nuys, CA, and best of all, we don't charge admission. Why not come in today for a test drive?